All our hatchets for sale use Hickory of the handles. Hickory is ideal because of its strength and also its elasticity. The elasticity of Hickory is an advantage because it will flex a little on impact and also absorb a lot of the vibration. Most Australian made axes use Australian hardwoods for handles. We have found native timbers do last a long time, but we’ve seen the head comes loose over time because the timber dries out and shrinks. And local hardwoods are not great at absorbing shock. The heads are sourced from Prandi in northern Italy. We have chosen two different designs for our Australian made axes to suit different needs. The Yankee design is perfect for heavier chopping, splitting, setting up campsites and butchery. Whereas the German style has broad cheeks make it perfect for splitting firewood, carving and camping duties. It’s a little lighter and great choice for an all-purpose hatchet. Created by Oliver, this is his signature range. They are Australian made axes and hatchets built from the finest materials available. The handles are a result of a tireless pursuit for perfect design. Driven by purpose and ergonomic design. The handle is both concave and convex and the head sits a little ‘behind’ the hand. This keeps the weight nice and even when striking a piece of wood. The curve of the handle (where the hand is placed) is designed with two purposes in mind, The first is for power with the hand placed right at the base where it sits safely against the wider base of the tool. The second is for accuracy where the hand is placed further up the handle. This grip is better for carving, limbing small branches or any task favouring accuracy over power. The heads are handcrafted by Prandi who are based in Primaluna Italy. Prandi are proudly third generation Italian toolmakers. Their steel and their tool making skills are amongst the best in the world. 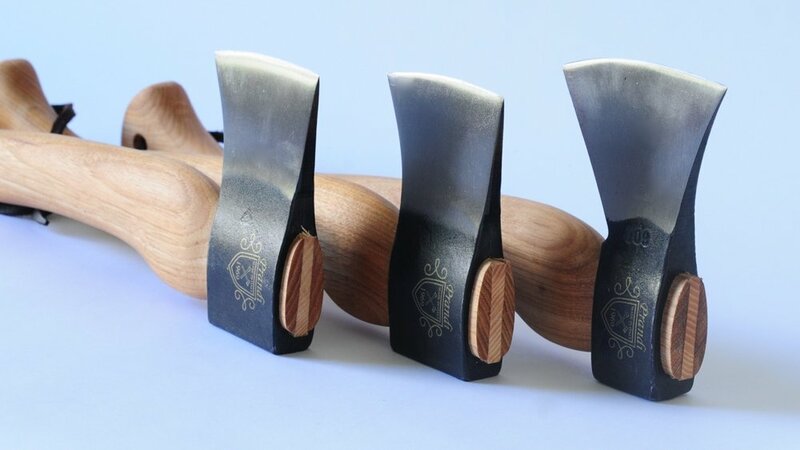 I approached Prandi after a worldwide search for the best quality hatchets for traditional bushcraft and woodworking. As the last of the traditional axe makers, Prandi are truly world leaders their field and I am proud to collaborate with them in Australia. Since 1969 Prandi have sourced their steel from the famous town of Brescia, known for its steelcraft. The steel is mined there and made into billets, which go on to be made into axe heads using a time honoured process. The Video here is on Oliver in his workshop assembling one of the tools. The blades are hardened to between 47 and 55 HRC (Rockwell hardness) depending on the size of the tool. These values are ideal because of the relationship between thickness and resistance. The blade shouldn’t be harder than 55 HRC because the steel structure will be too brittle, and it could break it during the impact with hard wood. The blade shouldn’t be softer than 47 HRC because the blade could be easily dented by hard wood.